You can start to clean your baby’s teeth even before any teeth are through. You should use a soft, clean, moistened cloth. Once a day is enough. After your child’s baby teeth are present, you can try to use a special toothbrush for babies. These toothbrushes have a small and extra soft bristles. If your child cannot tolerate this brush, you can continue to use a cloth until they can tolerate the brush. You gently massage your child’s teeth and gums in small circular motions to clean. This should be done as the last thing before going to sleep. At least up to the age of 18 months using plain water when brushing their teeth is sufficient. 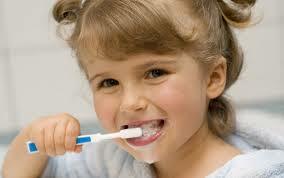 Around the age of three your child should become more used to the feeling of brushing. Brushing time should be increased to 2 minutes and the number of times a day should be two as well. Brushing should be done after breakfast and as the last thing before going to bed in the evening. Children don’t normally develop the manual dexterity in their wrist until 7 years old, so until then it’s your job as the parent or guardian to brush their teeth for them. Using a small children’s toothbrush with extra soft bristles is best. Toothpaste is the same, a pea size amount of kids strength toothpaste is plenty. The most effective technique of cleaning your child’s teeth is the modified bass technique. Encourage your child to spit out the toothpaste as best you can. If they have trouble with this make sure to rinse their mouth out with water. What is the correct way for brushing teeth? Around the age of five you should consider changing your child’s brushing habits slightly. Even though their manual dexterity is still improving, they need to know what it feels like to brush their own teeth. What you can do is let your child have a turn brushing their own teeth for 2 minutes doing the best they can, then you have a turn and clean your child’s teeth as well to make sure you get all the areas they missed. Remember to keep encouraging your child to spit out the excess toothpaste. If you want, you can even consider introducing a child’s electric toothbrush to improve cleaning. Electric toothbrushes are more effective for cleaning teeth than manual brushes. Around the age of seven you should start to let your child clean their own teeth. In saying this, still make sure your child is doing so properly by checking after they brush their teeth. If they have not cleaned adequately, tell them go back and clean it again or you can clean it for them. If the toothbrush is too small you can get a slightly larger size. Keep in mind though that a smaller brush will be easier to move around the mouth, thus, will clean better. Even adults can use small, kid size toothbrushes effectively. You can also change the toothpaste to an adult strength as long as your child can spit out the toothpaste effectively. Start off with a pea size amount when you change their toothpaste. As your child gets older you can leave more responsibility to your child to look after their own brushing. Even still keep an eye on them in case they start to get lax in their brushing; make sure they brush twice a day and two minutes at a time. Also it is recommended that they visit the dentist or oral health therapist every 6 months for a check up, clean and fluoride.